The first reviews of Doctor Who season 11's opener are beginning to emerge after the episode premiered in Sheffield, England earlier this week. Since Peter Capaldi's regeneration in the 2017 Christmas special, Doctor Who has undergone a great deal of change, most notably that for the first time in the show's illustrious history, a woman has been cast in the titular role, with Jodie Whittaker portraying the 13th Doctor. The other significant change of personnel during Who's off-season is that Chris Chibnall has now replaced Steven Moffat as chief executive and showrunner. A new logo, composer and camera format have also been introduced. Whittaker's Doctor is set to be flanked by no less than three companions, Graham (Bradley Walsh), Ryan (Tosin Cole) and Yasmin (Mandip Gill), but while the two Doctor Who season 11 trailers released have promised plenty of cinematic moments and running about, there has been little indication as to which villains may appear in the forthcoming season. Furthermore, while the majority of Doctor Who fans reacted positively to Whittaker's casting, there were some who felt that the Doctor should always be male and the world waits with baited breath to see whether Whittaker would prove the doubters wrong. "The sheer number of new characters, alongside guest star Sharon D Clarke, necessarily means that the alien menace is more of a low-key device to bring the characters together and introduce them to us, than a world-ending threat. That’s not to say that the creatures’ appearance won’t give children nightmares... The look of Doctor Who has taken on a more cinematic edge. The production team say they are conscious that they are making the show in the Netflix age, where people are used to watching lavishly expensive movies and TV shows across all their devices, without necessarily appreciating the huge gap in budget that a British domestic terrestrial TV production is afforded compared to series like Game of Thrones or Black Mirror." "Too dark and dour, but Jodie Whittaker is a delight... When Jodie Whittaker was announced as the 13th Doctor and the first female occupant of the Tardis, many fans raised their ire on social media, saying that the series was now ruined, that the Doctor should be a Time Lord, not a Time Lady. Having seen the first episode of this new series, it’s obvious that this vocal minority are wrong. Whittaker is a breath of fresh air: a talented, emotionally engaged actress who brings warmth and humanity to a show that was largely in danger of disappearing up its own black hole." 'The Woman Who Fell to Earth' is not perfect. It is, however, a promising start to a new era of Doctor Who that, if this first episode is anything to go on, is going to feel fresh and modern without losing the key components that have made the 55-year-old sci-fi show such an enduring success... Jodie Whittaker is terrific. She makes an incredibly assured debut, with a performance that's, quite literally, fizzing with energy. So much of the conversation about her casting, both positive and negative, has been about Whittaker's gender, but within seconds of her appearing on screen, it becomes clear just how little it matters." "[The show] looks beautiful in the show's new widescreen format Indeed, everything Jodie Whittaker and new showrunner Chris Chibnall have been promising us about the ramped-up, cinematic style of the new season turns out to be true. Those new lenses really do make a difference in giving the show a more textured, epic feel, matched by new composer Segun Akinola's atmospheric score." "Doctor Who has never looked better, from some visually-arresting locations – the most scenic areas of Sheffield get a good showing – all the way to the special effects from new VFX team Double Negative. The series premiere is a feast for the eyes, basically, and a credit to director Jamie Childs (who also directed Jodie Whittaker’s secret reveal video in 2017)... A few of the jokes (mainly focused on Whittaker getting used to her new incarnation) and lines of dialogue fall a bit flat. And on the whole it's definitely a less witty and quotable version of Who than we might have seen during the years of former showrunner Steven Moffat." "Whittaker sells herself as the Doctor immediately – nailing that indefinably alien core of the character, while also feeling relatable... For all the fuss made about her gender, it’s fitting what little difference it makes. She’s a thrill to watch. The opener is not as funny as it has been in the past (some gags are great, others land inelegantly), nor as complex (which will be good news to many), but it’s certainly the most sincere, endearing and accessible the show has been in a long time." "She [Jodie] may also be the breath of fresh air needed to revive a flagging franchise. She doesn’t always strike the right balance between quirky geek and masterful Time Lord. And at times she comes across as irritatingly childlike. But the highest praise is that you quickly forget you’re watching a female Doctor and just accept you’re watching THE Doctor." Although some reviews include criticism of the episode itself, the praise for Whittaker's Doctor is fairly unanimous, with several reaffirming that it doesn't take long for viewers to forget the gender issue completely. The generally positive comments toward the look and cinematography of the new series also give fans something to look forward to when the episode airs next month. Judging from the reviews, it certainly seems as though the Chibnall era is consciously heading in a different direction than that of former showrunner, Steven Moffat. 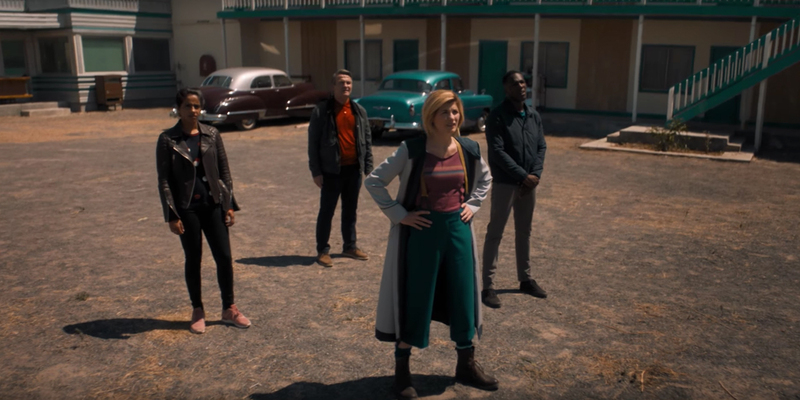 The write-ups tend to agree that "The Woman Who Fell To Earth" is more accessible and less referential about Doctor Who's history than before, as well as noticeably less quotable and witty - two of Moffat's trademark features. However, whether this is actually a bad thing depends on your point of view. While many enjoyed Moffat's tenure, he did attract criticism in later seasons for trying too hard to deliver quotable moments and for too often trying to revisit Doctor Who history; having Clara scatter herself throughout the Doctor's timeline for instance. Suggestions that the opening episode is too dark also come down to a matter of personal taste, with many preferring their Who on the grittier side. Doctor Who season 11 premieres with "The Woman Who Fell To Earth" October 7th on BBC.